This is a recipe I created for our local newspaper, The Gisborne Herald. Roasting cauliflower brings out intense flavours while keeping the florets tender and yet retaining a bite (broccoli is also very good when roasted). This recipe serves about 6 adults, with enough for left-overs. The left-overs in our house are fought over – everyone wants them for their lunch. And if you have seconds at dinner time, that means you miss out on pasta for lunch the following day. I have made this recipe with a chunk of flat pancetta (not sliced pancetta), however it is also very good using 5-6 rashers of streaky bacon instead of the pancetta. Spanish chorizo is a cured sausage however Mexican chorizo, fresh sausage meat, can be used instead. Alternatively substitute the chorizo with about 3 good quality sausages – I had some lovely lamb sausages which combined well with the bacon & cauliflower. 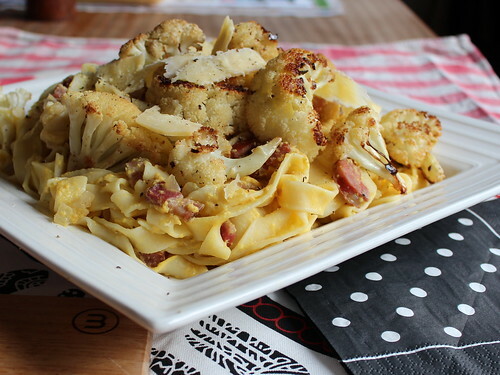 Cut cauliflower into florets (). Place in a baking dish, drizzle with oil, sprinkle with chilli flakes then season. Toss cauliflower well to coat in the oil. Bake in oven for about 40 minutes, until cauliflower is tender and beginning to caramelise. Stir the cauliflower about half way through, adding a little more oil if required. Bring a large pot of salted water to the boil. Add fettuccine and cook until al dente. While the pasta is cooking, prepare the sauce. Cut the pancetta into cubes and slice the chorizo into semi-circles about 5mm thick. Peel & dice the onions. Heat a heavy based frying pan. Add the pancetta & chorizo and cook over medium heat. Once the fat is beginning to release, add the onions. Continuing cooking until the onions are soft and fragrant. Drain the pasta, retaining 1 cup of the pasta cooking water. Beat the eggs in a medium bowl then whisk in the pasta cooking water. 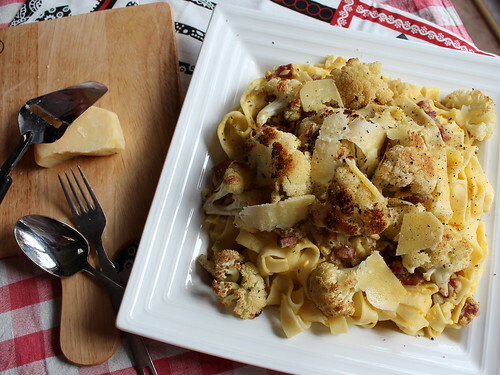 Place cooked pasta in a large serving platter, add roasted cauliflower, pancetta mixture and egg mixture. Toss everything together. Scatter freshly shaved parmesan cheese over the top and serve. 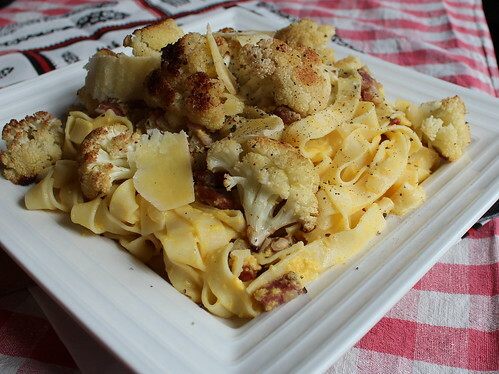 This entry was posted in Mains, Pasta, Savour and tagged roasted cauliflower, roasted cauliflower carbonara, Savour by Jo Dohrman. Bookmark the permalink.